I know I rarely do posts like this anymore, but this was just too good not to share. If you travel fairly often for work or you’re lucky and get to go on a lot of fun vacations, I bet you’ve been in the predicament of finding travel-sized versions of your favorite products. This spring is turning into a travel tizzy for me, and I want to make sure I’m able to take all of my most-used products with me but without the bulky size or weight of the containers. Well my friends, I have found a solution that is not only economical but eco-friendly too! 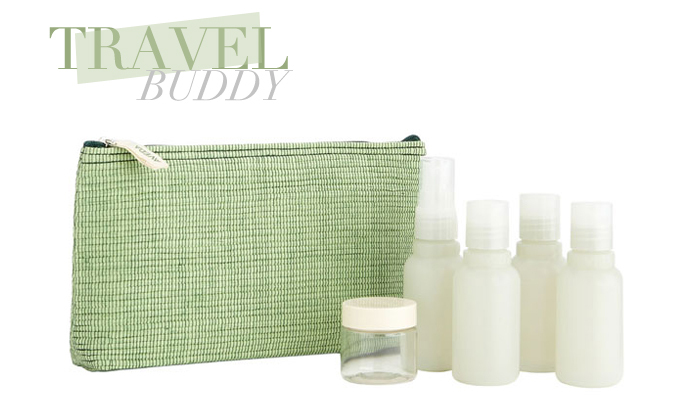 Say hello to Aveda’s “fill-ables” travel kit. Now I can bring a small container of my daily La Mer moisturizing gel cream, my face wash, nail polish remover, sunscreen and more all in the comfort of a small zipped bag. Last year I sacrificed my skin to the bitter wind and cold weather in NYC because I couldn’t fit my moisturizer. Never. Again. Get this miracle kit here for only $16. You’re welcome. I just go to Target and get the little empty bottles! Or I save them from hotels – it’s cheaper!